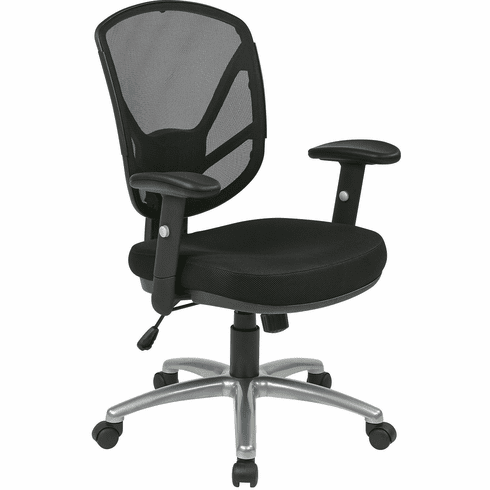 Screen Back 2-to-1 synchro Tilt Chair with Aluminum Finish Base. Thick Padded Contour Mesh Seat with Screen Back. One Touch Pneumatic Seat Height Adjustment. 2-to-1 synchro Tilt Control with Adjustable Tilt Tension. Height Adjustable PU Padded Arms. Heavy Duty Aluminum Finish Base with Dual Wheel Carpet Casters. Arms to Floor Max: 31"
Arms to Seat Min: 9"
Arms to Seat Max: 12.5"